The Mallee region has a great diversity of soil types that reflect differences in parent material, topography, climate, organic activity and age (e.g. degree of weathering). For agricultural purposes, many of these soils have some chemical and physical limitations (e.g. sodicity) which require careful management. 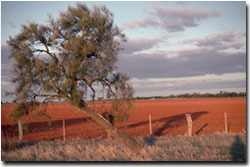 The soils of the region were described as part of a broad Land System survey by Rowan and Downes (1963). Very little soil survey work has followed, apart from a few detailed soil surveys in irrigation areas and studies associated with research farms.